Les questions centrales du projet concernent l’évolution de la socialité (sélection de parentèle, relations hôtes-parasites). Toutefois, les données de long-terme collectés quotidiennement ou ponctuellement (captures) permettent de répondre à diverses questions en écologie et en évolution. 180 individus composent la population, dont 140 sont individuellement reconnus et suivis quotidiennement (observations comportementales, suivis démographiques, mesures éco-physiologiques). Toutes les données du Projet Mandrillus sont compilées mensuellement dans une base de données (bientôt consultable). Charpentier MJE, Givalois L, Faurie C, Soghessa O, Simon F, Kappeler PM. 2018. Seasonal glucocorticoid production correlates with a suite of small-magnitude environmental, demographic and physiological effects in mandrills. American Journal of Physical Anthropology 165: 20-33. Percher A, Merceron G, Nsi Akoue G, Galbany J, Romero A, Charpentier MJE. 2018. Dental Microwear Textural Analysis as an analytical tool to depict individual traits and reconstruct the diet of a primate. American Journal of Physical Anthropology 165: 123-138. Percher A, Romero A, Galbany J, Nsi Akoue G, Pérez-Pérez A, Charpentier MJE. 2017. Buccal dental-microwear and dietary ecology in a free-ranging population of mandrills (Mandrillus sphinx) from southern Gabon. PLoS ONE 12(10): e0186870. Poirotte C, Benhamou S, Mandjembe A, Willaume E, Kappeler PM, Charpentier MJE. 2017. Gastro-intestinal parasitism and recursive movements in free-ranging mandrills. Animal Behaviour 134: 87-98. Beaulieu M, Benoit L, Abaga S, Kappeler PM, Charpentier MJE. 2017. Mind the cell: Seasonal variation in telomere length mirrors changes in leukocyte profile. Molecular Ecology 26: 5603-5613. Pouillevet H, Dibakou S, Ngoubangoye B, Poirotte C, Charpentier MJE. 2017. A comparative study of four methods for the detection of nematodes eggs and large protozoan cysts in mandrill faecal material. Folia Primatologica 88: 344-357. Nsi Akoue G, Mbading-Mbading W, Willaume E, Souza A, Mbatchi B, Charpentier MJE. 2017. Seasonal and individual predictors of diet in a free-ranging population of mandrills. Ethology 123: 600-613. Poirotte C, Massol F, Herbert A, Willaume E, Bomo PM, Kappeler PM, Charpentier MJE. 2017. Mandrills use olfaction to socially avoid parasitized conspecifics. Science Advances 3: e1601721. Charpentier MJE, Harté M, Ngoubangoye B, Herbert A, Kappeler PM. 2017. Visual discrimination of kin in mandrills. Ethology 123: 251-259. Poirotte C, Basset D, Willaume E, Makaba F, Kappeler PM, Charpentier MJE. 2016. Environmental and individual determinants of parasite richness across seasons in a wild population of mandrills (Mandrillus sphinx). American Journal of Physical Anthropology 159: 442-456. Levréro F, Carrete-Vega G, Herbert A, Lawabi I, Courtiol A, Willaume E, Kappeler PM, Charpentier MJE. 2015. Social shaping of voices does not impair phenotype matching of kinship in mandrills. Nature Communications 6: 7609. Brockmeyer T, Kappeler PM, Willaume E, Benoit L, Mboumba S, Charpentier MJE. 2015. 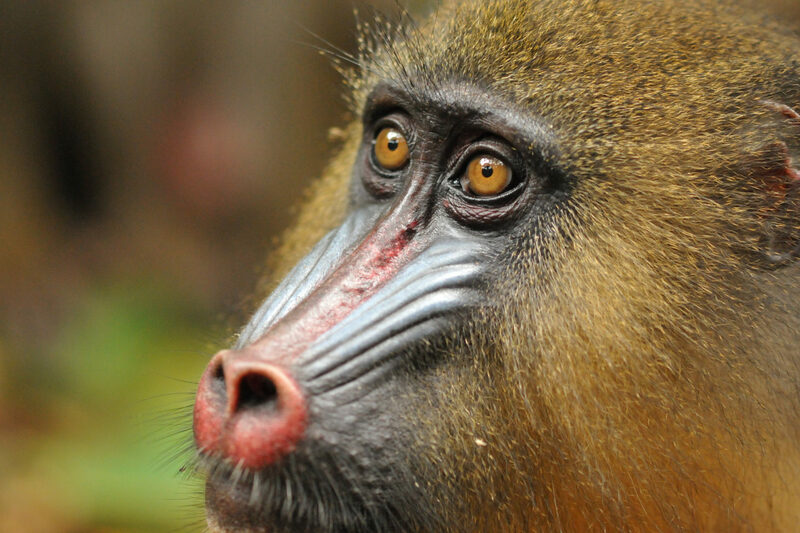 Social organization and space use of a wild mandrill (Mandrillus sphinx) group. American Journal of Primatology 77:1036-1048. Benoit L, Mboumba S, Willaume S, Kappeler PM, Charpentier MJE. 2014. Using next-generation sequencing methods to isolate and characterize 24 simple sequence repeat loci in mandrills (Mandrillus sphinx). Conservation Genetics Resources 6: 903-905. Beaulieu M, Mboumba S, Willaume E, Kappeler PM, Charpentier MJE. 2014. The oxidative cost of unstable social dominance. Journal of Experimental Biology 217: 2629-2632. Galbany J, Romero A, Mayo-Alesón M, Itsoma F, Gamarra B, Pérez-Pérez A, Willaume E, Kappeler PM, Charpentier MJE. 2014. Age-related tooth wear differs between forest and savanna primates. PlosOne 9: e94938.